In Zog’s aircar high above the city, the Triceraton Commando hurls the unsuspecting Donatello from his seat, toward the streets below. Don isn’t down for the count yet, however, and quickly forms a helicopter propeller with his cyborg armor. Back in the aircar, the Triceraton spares Horridus from a similar fate, as he recognizes her alien species as being of a Saurian nature related to his. Horridus is intrigued, as she’d never met another alien like herself, having been born on Earth. Suddenly, the aircar flips over, dumping the Triceraton (but not Horridus, who had buckled up). Don takes back the driver’s seat, having used the aircar’s remote control to get rid of the carjacker. Horridus begs Don to go see if the Triceraton is okay, as she has a lot of questions for him. Don concedes, and flies down toward the Museum of Natural History, where the Triceraton had crashed through the roof. At Mike's apartment, Splinter is busy watching South Park when Don calls with warning about the Triceratons. Splinter agrees to pass on the warning, unaware that Pimiko lurks in the shadows behind him. And at the museum, Don and Horridus find the Triceraton dead amongst the display of dinosaur skeletons. Horridus begins arguing with Don, angry that he killed him, and neither notice another pair of Triceraton Commandos materialize behind them with their short-range transmat. The Commandos open fire and Don and Horridus duck for cover. At April’s apartment building, Casey heads down through Mike's entrance and finds Splinter sitting casually atop Pimiko, whom he has subdued and bound with a telephone cord. At Splinter’s instruction, they sit Pimiko down in the kitchen, hoping to get her to explain herself over a pot of tea. But as soon as her hands are free, she opts to splash the hot tea in Casey’s face and escape into the sewers. Casey gives chase, bumping into Leo on the way out. Leo meets with Splinter and both compare notes about the impending Triceraton invasion. Casey returns, having lost Pimiko, and Leo decides they’d best split up: Leo will go to the Foot Clan for help while Casey heads to Leatherhead’s lair to join Mikey. Don, unfortunately, will have to fend for himself. At the museum, the pair of Commandos are disgusted by the sight of all the dinosaur bones, swearing to annihilate all of humanity in honor of their fallen “brethren”. Horridus is equally disgusted with Don and ditches him to go talk with the Triceratons. The Triceratons aren’t in a talking mood, however, and blast her. Enraged, Don rushes the aliens. At Foot HQ, Raph (as the Shredder) thinks to himself that the New York branch of the Foot are slowly rebuilding under his leadership; their ranks having grown to sixty and climbing. Alas, though he’d intended to turn the Foot into a force for good, the costs of maintaining the Clan have forced him to fall back on their old ways: robbery and assassinations. Raph ponders what he has become. Suddenly, Leo bursts in. 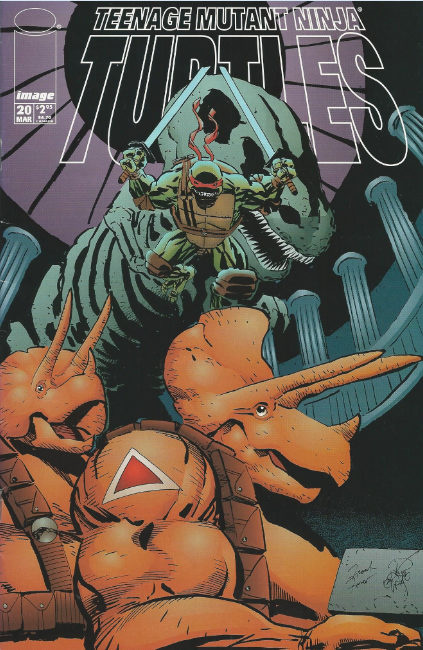 Raph calls off the Foot Soldiers and Leo explains that the Triceratons are mounting an invasion. Considering the Triceratons to be good training fodder, Raph orders his Foot Soldiers to prepare for war. At Leatherhead’s lair, Casey, Mike, Leatherhead and Doctor X lurk in the shadows, watching the remaining Commandos repair Leatherhead's transmat. Casey and Mike brainstorm that if they destroy the transmat, the Triceratons won’t be able to use their short-range transmat devices to reach Earth anymore. Leatherhead disagrees, going all bestial and grabs Mike by the throat. Doctor X calms his gator friend and Leatherhead releases Mike. Recovering, Mike confides in Casey that Doctor X believes Leatherhead’s mutagen is wearing off, reverting him back to a mindless animal. Casey asks what that means for the Turtles, but before he can get an answer, more Triceraton Commandos appear in the transmat. With no option but to fight, Mike, Casey and Leatherhead leap into action. *This story is continued from TMNT (Vol. 3) #19. The story continues in TMNT (Vol. 3) #21. 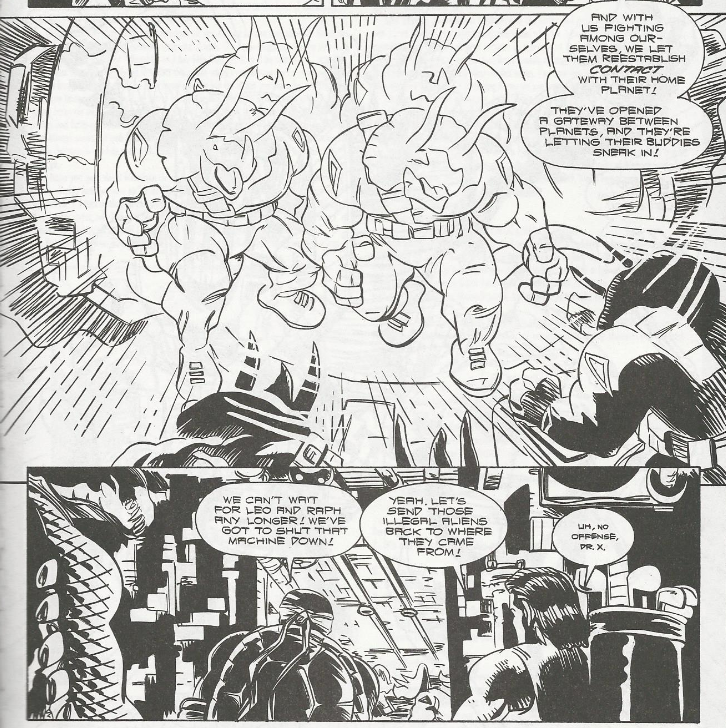 *This issue included a piece of bonus concept art from Ryan Brown featuring Leatherhead and Doctor X. *Pimiko last encountered the Turtles in TMNT (Vol. 3) #5. She was last glimpsed in TMNT (Vol. 3) #18. Carlson’s really got a lot going on in this series, yet all the plot threads manage to coalesce rather naturally. But such is the folly of Image characters trying to coexist in a creator-owned “universe” where important elements only exist so long as the rights-holders feel like “playing ball”. 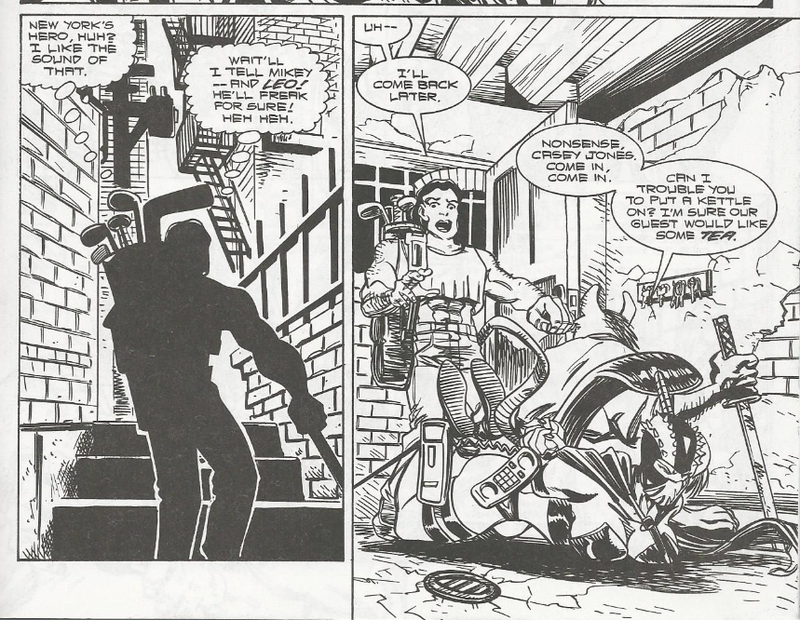 I’m not sure what Horridus's status in Savage Dragon is, these days. Wikipedia says she’s dead and has been replaced by a version from an alternate dimension or something. That’s kind of a bummer. So far as the main plot is concerned, this is a lower level “Triceraton invasion” then what most of you have probably already witnessed via the 4Kids cartoon. I’m rather glad that the Image series took a more low-key approach over anything epic or world-shattering, as that sort of stuff just feels way out of the Turtles’ league. I’d much rather read stories about the Turtles having one-on-one encounters with Triceraton Commandos in the sewers and after-hours museums than stories about the Turtles piloting starships and firing photon torpedoes at the Triceraton mothership to save the Earth. 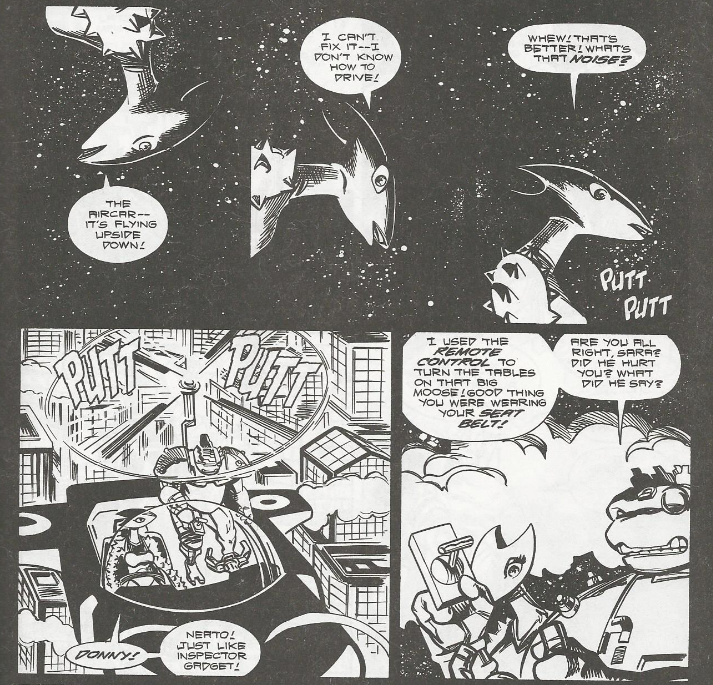 On a side note that I forgot to mention in my review for last issue: kudos to Carlson for remembering that Triceratons can’t breathe Earth’s atmosphere; subtly having the Commandos cough inbetween sentences. Another building plot thread sees Pimiko returning after a tremendously long absence from the book. Barring her shadowy appearance in issue #18, it’s hard to believe we haven’t seen her in fifteen issues. While we still don’t know what she’s up to, I’ve got to say, I got a kick out of Splinter’s “I’ve still got it!” moment. And as with last issue, one of the most interesting things to come out of this installment is Raph’s inner turmoil with his new role as the Shredder and his ever-increasing distancing from his family. The volume ended before it could truly bear fruit from this plot point, but you can tell that Carlson was going somewhere big with all this and that a major reckoning was brewing. A considerable disappointment that we never got to see it. If I have any real complaint about this issue, I suppose it’s that it was very, very poorly edited. There are spelling errors all over the place. And having come out a month late, too, that’s just sort of salt on the wound.